Today’s challenge: Make a 3d model of a Lego project using Lego CAD software. There are several applications which allow Lego builders to build models using computer software instead of using real plastic bricks. I’m sure some people do this to prototype models they want to build but do not have sufficient bricks to create. I think others use this instead of building real models at all. Lastly, others use the same software to create instructions for other Lego enthusiasts to build models that they designed. I don’t have any interest in building models in 3d software as an alternative to building with real bricks, so for this project, I simply wanted to take a model I had already built and re-create it in the computer to see how easy it is. If it were practical, I might also share instructions for building my model on my website. 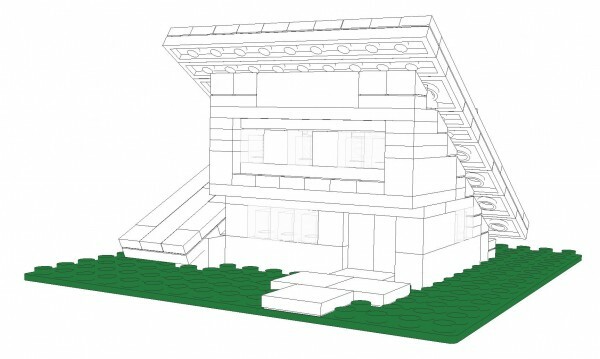 Adult Lego enthusiasts have been using the LDraw application for nearly 20 years. It is very powerful but less friendly to learn and use. In under an hour, I was able to build an accurate model of the basic structure of the home using the Lego Digital Designer tool. Modeling the roof with the hinged sections was much more time consuming, and I couldn’t figure out any way to position the roof on top of the home in that app. The Lego Digital Designer app looks easy to use, with a nice gallery on the side and seemingly straightforward controls, but it’s really limited and clumsy to use. After that, I decided to give LeoCAD a try. (It’s one of several apps in the LDraw suite.) It did allow me to roughly position the roof on top of the home, but I never could position it quite right, nor could I get the angles of the two roof sections quite right. This app is even less intuitive to use, and I have experience with a variety of 3d design tools. I’m sure I could get things right if I had more patience and interest, but this is where I stopped. The same model with roof attached in LeoCAD software. I love LEGO constructions and also 3d printing. I use to 3d print some pieces and make my own models. Some of them I download from here https://www.stlfinder.com/3dmodels/lego and you can even customize your own. Results are great!